Once you spend the time closing all the buckles on the Spectre boot you are rewarded with great skiing. 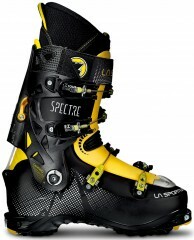 The Spectre is the lightest four-buckle boot on the market and it offers pinpoint control over your skis. But it doesn’t climb like a typical four-buckle beast since it has 60° of articulation. The boot is wider in last that most two-buckle boots, and offers enough support for bigger skiers. The walk/ski mode is solid and easy to engage, and it readily accepts crampons. The liner and power strap are cush. The La Sportiva Spectre is head and shoulders above the competition in terms of climbing to ski. Lower shell is made of Gilamid® which is light and stiff. Four Pegasus buckles® are micro-adjustable while in-place. Carbon-reinforced Grilamid vertebra adds stiffness from the rear. EZ Thermo Liner is plush and supportive with flex zones. Marfram® spoiler increases cuff height for quicker response. 60° range of motion is as much as some two-buckle boots. EZ Flex tongue is stiff Grilamid with a flex zone for skinning. Vibram® sole has hardened wear areas and a cool grip pattern. Canting adjustment helps to align your lower legs. Winner of many Editors choice awards. Hello! I have heard these run a bit large. Do you think that is true? I am normally a 28 but maybe I should get a 28.5? Thanks! Hi Caitlin, yes you can normally go down a half size from the chart on these. I wanted to beef up my boot option this year after exclusively using light boots since I ditched my tele setup. Being that I love my LaSportiva Spitfires (tho they are starting to exhibit some problems going into downhill mode!) I thought I'd give the Spectre's a try. They ski down pretty well ... not super stiff but notably stiffer than the Spitfires. Tell me something you don't already know you say. Well ... here is the problem: I know some folks rave about the buckles but not me. They come loose all the time, can be finicky with gloves on, the cable can become bent ... after which they don't line up for buckling properly ... just not ready for primetime IMHO. The other issue is the liner: The manufacturer recommends "hot blower" molding instead of baking ... fine. I did that. Unfortunately there really wasn't any molding to be had. Compared to Intuition liners these are clear losers. I went with some Scarpa Maelstrals and have been much happier, both up, down, stiffness, and comfort ... at a small weight gain. I hope Sportiva revisits this boot as their foot shape and sizing is good for me. What is the sole length for a size 27.0? Hi Ryan, size 27 and 27.5 have a 304mm BSL.